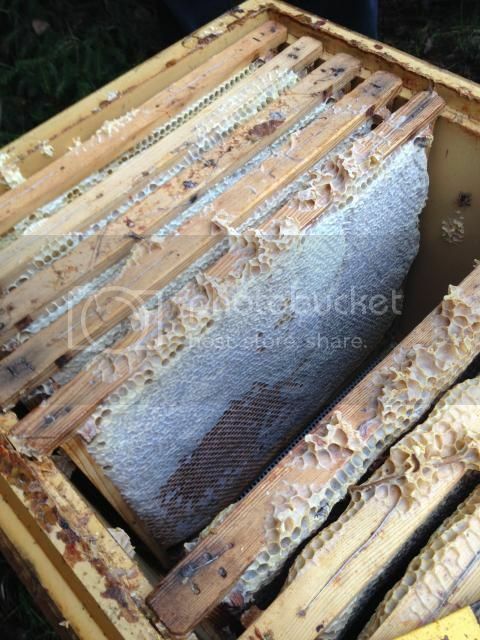 Posted: Thu Oct 30, 2014 2:33 pm Post subject: Bees gone missing ??? I just inspected my father-in-laws hives and one hive was entirely empty of bees. It was a this years swarm. They had plenty of stores, pollen, some capped brood and many dried up larvae in all stages. 1 month ago this hive had many bees and a laying queen. Now the bees are gone. There are no dead bees on the bottom, no wax capping either. I'm sure it's not robbing. Another beek has 2 hives beside his so we opened those to find one of his hives also without bees. Same thing; lots of stores, pollen, some capped brood and dried larvae. 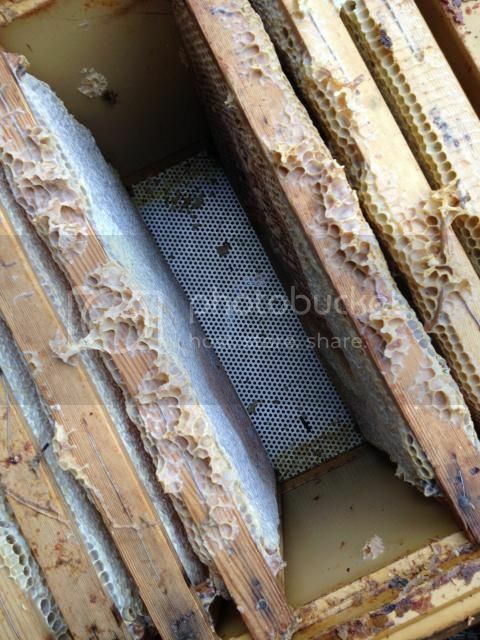 At first we thought someone stole the bees by shaking them frame by frame but all frames are well propolized and all brace comb is attached to the walls and frames. Other hives seem all right. Any ideas? 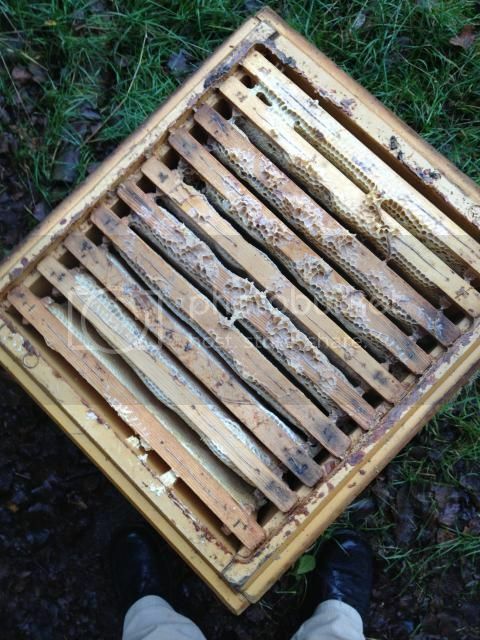 To add; all hives were treated for varroa in September. That sounds like varroa to me. Other diseases produce dead bees on the bottom. You see empty hives with queenless hives, but you won't find dead brood. You find queen cells or drone broodcells. And you usually do not find those hives side by side to other empty hives. 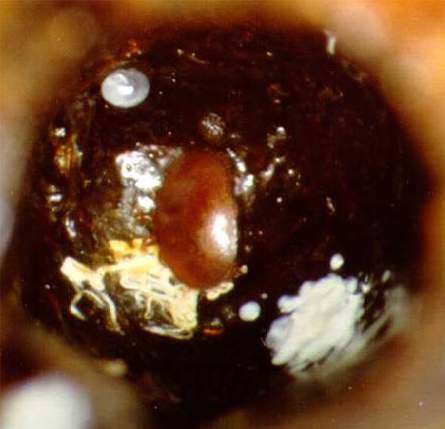 Turn a comb upside down and have a look to the ceiling of each cell - you will find white debris at the ceiling which is the defecating site of varroa mites. With varroa deadouts you see a lot of this white stuff at the upper side of a cell. Really ? Going from healthy hive to nothing in a month ? Isn't this classic CCD ? I was looking carefully into the brood nest cells to see if there are small larvae in and could not see white spots (which are otherwise easily seen). I even poked the capped cells with a stick to check if AFB is the issue but nope, the pupae where soft but not sticky. Each brood comb had max 10 capped brood cells not more. All in a spotty patern, here and there. This alone means that most of the capped brood had emerged. They had no Drone brood. In case of CCD the queen should still be in the hive with a handful of house bees, no? Going from healthy hive to nothing in a month ? Yes, in less than weeks. Too much is too much. CCD is different. Poisoning is different. I reckon it was what happened to my Perone MK1 last year from lots of bees to no bees in a matter of weeks and that tell tale white frass (insect poo) in the cells. No dead bees, no capped brood, no larvae...some chewed out queen cells but oddly and eerily empty. Varroa then I suppose. 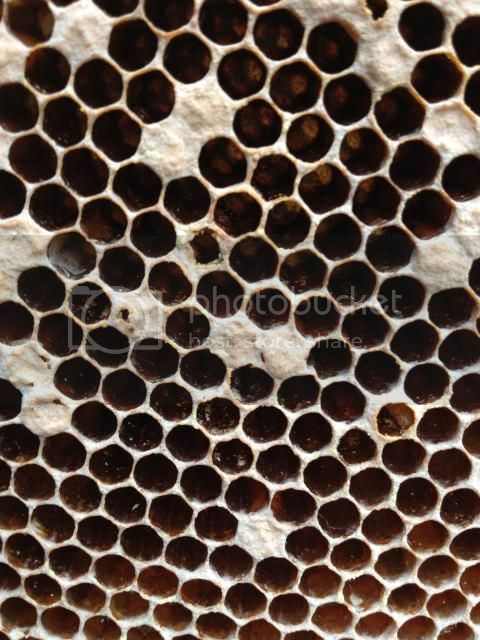 small holes in brood cappings. Yes but how is this possible in hives treated twice a year with Formic then with Oxalic acid? I mean this is an old beek who had bees for more than 30 years. How can anyone place trust in treatments since they obviously are creating more resistant mites and weaker bees. Why is so hard for us to trust Nature instead? That is a classic picture of varroa damage. When he treated in September did he ascertain the colony strength? Maybe it was too late at that point. Another problem is where a colony which has been treated robs out a collapsing colony nearby and brings home the mites.